Lucas Sundberg Sims (born May 10, 1994) is an American professional baseball pitcher for the Cincinnati Reds of Major League Baseball (MLB). He has previously played for the Atlanta Braves. Sims was drafted by the Atlanta Braves in the first round of the 2012 Major League Baseball Draft, 21st overall, out of Brookwood High School in Snellville, Georgia. He signed with the Braves, receiving a $1.65 million signing bonus. During his first professional season he pitched for the rookie level Gulf Coast League Braves and Danville Braves. He finished 2-4 with a 3.71 earned run average with 39 strikeouts in 34 innings pitched. Sims played the 2013 season with the Class-A Rome Braves. He started the season in the bullpen but was then moved to the rotation. He finished the season 12-4 with a 2.62 ERA and 134 strikeouts in ​116 2⁄3 innings. 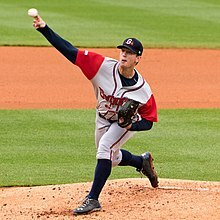 In 2013, Sims was considered the Braves best prospect according to MLB.com. In 2014 he was 8-11 with a 4.20 ERA in Class A+. He had fallen to third on the same list by the start of the 2015 season, and was placed seventh on the year-end list. Between three teams, he was 7-6 with a 4.37 ERA. The Braves sent Sims to the Arizona Fall League in 2015. He opened the AFL season for the Peoria Javelinas, and also started the Fall Stars Game. Sims started 2016 as the Braves # 13 prospect according to Baseball America, and was invited to spring training for the first time. He began the season with the Mississippi Braves, and was promoted to Gwinnett on April 23. He struggled in the International League and returned to Mississippi on June 17. Sims finished 2016 with a 7-11 record and a 4.40 ERA; his 92 walks were the fourth-highest total in the minor leagues, and more than the total of any major leaguer. The Braves added him to their 40-man roster after the season. Sims faced the Los Angeles Dodgers on August 1, 2017, in his major league debut. He pitched six innings, yielding three earned runs and recording three strikeouts. The debuts of Sims and Ozzie Albies marked the first time since 1968 that the Atlanta Braves started two players making their first major league appearance on the same day. He finished the season 3-6, with a 5.62 ERA. In December 2017, Braves manager Brian Snitker said that he might look at Max Fried, Sims, or another pitcher as the team's fifth starter in 2018. Sims spent time with the major league team in spring training, but began the 2018 season in Gwinnett. On July 30, 2018, the Braves traded Sims, Matt Wisler, and Preston Tucker to the Cincinnati Reds in exchange for Adam Duvall. ^ "Braves stick with local strategy for first pick". MLB.com. May 24, 2013. Retrieved November 22, 2013. ^ Carroll Rogers (June 4, 2012). "Brookwood's Sims "ecstatic" to be drafted by Braves in first round – updated". Blogs.ajc.com. Archived from the original on January 1, 2014. Retrieved November 22, 2013. ^ Carroll Rogers (June 7, 2012). "Braves sign Sims to $1.65 million bonus | Atlanta Braves". Blogs.ajc.com. Archived from the original on January 6, 2014. Retrieved January 13, 2014. ^ "Bullpen work aiding Braves prospect Sims". Mlb.mlb.com. April 17, 2013. Retrieved November 22, 2013. ^ "Braves prospect Sims matures quickly". Gwinnettdailypost.com. Retrieved November 22, 2013. ^ "2013 Prospect Watch Atlanta Braves". MLB.com. May 24, 2013. Retrieved November 22, 2013. ^ Wild, Danny (May 15, 2015). "Six Mudcats on DL following bus accident". MILB.com. Retrieved September 2, 2015. ^ Bowman, Mark (September 1, 2015). "Sims among Braves prospects headed to Fall League". MLB.com. Retrieved September 2, 2015. ^ Mayo, Jonathan (October 27, 2015). "Braves in AFL: Sims grows following difficult season". MLB.com. Retrieved November 24, 2015. ^ Pleskoff, Bernie (November 23, 2015). "Scouting profile: Lucas Sims". Retrieved November 24, 2015. ^ Bowman, Mark (February 12, 2016). "Braves have spring in their step on Truck Day". MLB.com. Retrieved February 12, 2016. ^ "Hot starts among Braves' farmhands". Atlanta Journal Constitution. April 11, 2016. Retrieved April 12, 2016. ^ Bowman, Mark (April 23, 2016). "Braves add lefty Marksberry to 'pen, option Kelly". MLB.com. Retrieved April 23, 2016. ^ "Ellis promoted to Gwinnett, Sims back to Mississippi". Atlanta Journal Constitution. June 17, 2016. Retrieved June 20, 2016. ^ "Lucas Sims Stats, Highlights, Bio - MiLB.com Stats - The Official Site of Minor League Baseball". Retrieved November 19, 2016. ^ "Braves add 3 prospects to 40-man roster". Retrieved November 19, 2016. ^ Thompson, Jaylon; Sachs, Aimee (August 2, 2017). "Sims' solid debut, Camargo's HR can't stop LA". MLB.com. Retrieved August 2, 2017. ^ Burns, Gabriel (August 2, 2017). "Five years later, Lucas Sims debuts with his hometown Braves". Atlanta Journal Constitution. Retrieved August 3, 2017. ^ "Order the Braves’ 2018 starting rotation," Atlanta Journal Constitution. ^ Bowman, Mark (March 24, 2018). "Braves option Sims, Blair, Wisler to Triple-A". MLB.com. Retrieved March 25, 2018. ^ Burns, Gabriel (July 30, 2018). "Braves acquire Adam Duvall for trio of players". Atlanta Journal Constitution. Retrieved July 30, 2018. ^ Kelly, Matt (July 30, 2018). "Braves acquire former All-Star Duvall from Reds". MLB.com. Retrieved July 30, 2018. This page was last edited on 15 November 2018, at 05:12 (UTC).